The latest generation of processors has arrived. Experience unrivalled power and performance with the Intel Core i3 processor and do more at once. 4GB of DDR3 memory lets you run multiple applications at lightning fast speeds, leading to faster loading times and smoother performance than before. Pack your data, images, videos and games onto the huge 500GB hard drive and take it with you wherever you go. Integrated High Definition Intel graphics deliver the latest graphics experience in all multimedia including the newest games, films and music. Designed to be both packed full of the latest technology and look stylish, the Vostro is finish in a fingerprint and smudge proof London Slate Grey. Connect with your friends and enjoy a high-definition video calling experience with the 1.3MP webcam and integrated microphone. With the wireless 802.11g/n and Bluetooth 3.0+HS connectivity you can stay connected while one the move, and enjoy some of the fastest internet speeds around. 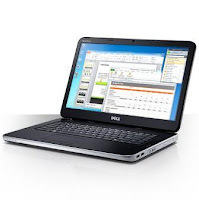 Dell Vostro 1540 with i3-370M is currently offer for around 400 Euros and you can easily find similar product from another brand. This laptop offers good performance, solid feel and competitive price.